Happy Friday Friends! 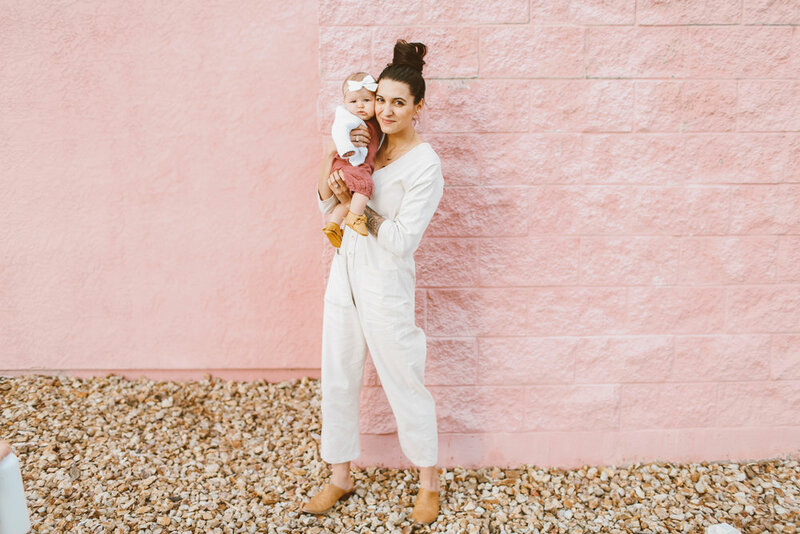 I just wanted to pop in and share this Mama Style post real fast before I try unplugging for the weekend! I got this jumpsuit from The Stock Place and have worn it just about every day since! It's the perfect boxy fit, easy to nurse in and under $60! Link right HERE. It also comes in Charcoal for all of you wondering how to keep something clean with toddlers sticky fingers. I have at least 3 friends who have ordered it after seeing mine and I'm looking forward to the day where we show up at the same coffee shop wearing the same thing. My favorite things about Jumpsuits is that they are such an easy choice. I go into my closet and have to pick 1 single thing. Minimal thought yet lots of style and usually jumpsuits always start a conversation. I loved shooting these photos because A. Give me PINK everything and B. Olive actually was posing and asked her papa to snap photos of just her! Which is great because usually she just wants to play and not really be in them, which we always try and respect and C. PEARLS CHUNK. Gosh, I love those girls! I hope you all have a great weekend! More posts from the Stock Place HERE. Olives wearing a piece from our friend's shop, shoplilylily and her shoes are from Old Navy. Goals, Routines and Mental Health! !